The last of the Rocky Mountains, along the Trans-Canada Highway. Two weeks ago, June 21 and 22, 2015. So, yesterday was the Fourth, which means I didn’t spend a whole lot of time on the computer. Plus my monitor died Friday night. Fortunately, Best Buy was open on the holiday. The penultimate day of my trip was the summer solstice. I also crossed back into the Pacific Time Zone, so it was quite a long day. I woke up at the crack of dawn again, into a gray-gloomy rainy day (which sounds so lovely right now — the temperature outside right now is over 90F, and has been for the last five days). I’d had a reservation at a hostel in Kelowna, 215 miles down the road from Golden, but I’d decided to cancel it the previous night, because, well, now that I was on my way home, I wanted to see how far I could get. I always get sort of antsy the last day or two on the road on a trip like this — ready to get home. I headed west again on the Trans-Canada Highway, through two more smaller national parks, Glacier National Park (yes, Canada has a national park called Glacier, too), and Mt. Revelstoke National Park, but there really wasn’t much reason to stop. The section through Glacier, over Rogers Pass, was the last section of the Trans-Canada Highway to be completed, in 1962. That road is younger than I am! There’s a historical site at what I’d call a rest area here in the States at the top of the pass, and I stopped to take a few pictures. Approaching Rogers Pass, in Glacier National Park. Trans-Canada Highway monument, Rogers Pass. Looking east from the Rogers Pass Monument. From there on it was down, down, down. I stopped in the town of Revelstoke, at a combo Tim Hortons and gas station, for liquid refreshment for both me and Kestrel, then turned south off of the Trans-Canada at the small town of Sicamous, onto Highway 97, which stays the same number in both Canada and the U.S.
Chicory flowers, near Sicamous, BC. I drove past a pretty lake, and saw some blue wildflowers that had to be inspected and photographed, then south to the big city of Kelowna, where I arrived just in time for lunch (and was really glad I’d cancelled my hostel reservation). By that point, I’d left the lush forests of the western side of the Rockies behind, not to mention the rain and the cool temperatures. It was almost 30C, according to a bank thermometer in Kelowna, which translates to the lower 80sF, and not a cloud in the sky. It only got hotter the further I went, too. The map had been somewhat misleading. I’d assumed that the double line that was Hwy. 97 through Kelowna meant that I’d be on a freeway, but no, just a four-lane boulevard with stoplights every hundred yards or so. It took me a while to fight my way through the traffic and reach the bridge across long, narrow Lake Okanagan. Then, after I was out of town, it turned into a freeway. Oh, well. A glimpse of Lake Okanagan, south of Kelowna, BC. Lake Okanagan is lovely, and the road clings to the cliff as it threads its way down past vineyards and through small towns and the good-sized city of Penticton. After Penticton, orchards were the order of the day, and I could have stopped and bought cherries any number of times. Alas, I was down to my last couple of Canadian dollars and didn’t want to get more at this stage, plus, I wasn’t sure if U.S. customs would let me through with them. So I didn’t. I reached the U.S. customs station, just north of the little town of Oroville, Washington, along the shores of Lake Osoyoos (oh-SOY-oos — I asked the customs agent), about the middle of the afternoon. A very nice Hispanic lady checked my passport, asked me to take my sunglasses off for a moment so she could get a better look at my face, and to pop my trunk. If I’d known she was going to want to look in there, I’d have put all my dirty clothes back in my suitcase, but the only comment she made was how she, too, liked the brand of chips I had in my food bag. Oh, well, worse things have happened. And then I was back in the land of miles and Fahrenheit (a rather high degree of Fahrenheit at that, almost 90 degrees, alas). I drove past Tonasket, which was the knot of the lasso of this trip, on to Omak, another hour or so, and got there around four. Found the motel I stayed at on my research jaunts for Sojourn, and crashed and burned. I’d been on the road since about 6 am Pacific time, and I slept like I was really working at it. And the next day I got up and drove the five hours home, over familiar roads, down 97 past Wenatchee to Blewett Pass, to I-90 and home. I think I made three stops, one for gas and real MickeyD’s iced tea in Brewster, one just north of Wenatchee for cherries, and one just before I got back on I-90 to gather one last picnic from my cooler and food bag for lunch that I ate as I drove over Snoqualmie Pass. I got home about 2 in the afternoon. The condo hadn’t burned down and the cats were fine (although extremely eager to go outside, and beyond annoyed with me). And that was my trip to the Canadian Rockies. Decidedly one of the best trips I’ve made in recent memory. Thirteen days ago, June 20, 2015. And so I turned towards home. But I had one more day in the Rockies, driving back down the Icefields Parkway, then west through yet another national park, so while I might have been headed back technically, there was still more than plenty to see. For some reason I woke up at the crack of dawn, and was on the road by 7:30 in the morning. I wake up a lot earlier than I normally do when I’m traveling, but this was sort of ridiculous. On the bright side, because I was out so early, I got to see some elk alongside the road just south of Jasper townsite. Elk just south of Jasper townsite. I’m sort of jaded about elk — I’ve seen so many of them in Yellowstone, and even had one bull in rut bugle under my hotel room window all night there once — but they’re still beautiful animals. I was less enamored of the tourons who were walking right up to them to take photos, but Darwin knows what to do with them. Athabaska Glacier, 1970. The parking lot is in the same place in the photo below. Athabaska Glacier, 2015. The glacier has retreated about half a mile. Then it was down, down, down into the Bow Valley, with one brief stop to keep from running over another small group of bighorn sheep, to Lake Louise village, where I bought tea and then headed west on the Trans-Canada Highway toward Kicking Horse Pass, my last crossing of the Continental Divide, and Yoho National Park. Female bighorn sheep, just south of Bow Pass. Kicking Horse Pass (so named because an early explorer got kicked in the head by his horse there) was a fascinating place. I’m not that much of a railroad buff, although I’ve ridden Amtrak cross-country several times, but I’d never seen a railroad do what this one does before. The grade is so steep that it was all but impossible for trains to make it over the pass. That is, until an engineer got the bright idea to build tunnels in a figure eight configuration, giving more room for the trains to climb more gradually, with the tracks crossing over themselves as they climbed. If the train is long enough, you can see the engines and first cars passing directly over the later cars below them. I was lucky enough to be there when a long train passed through, and actually got to see this happen. It was hard to get good photos, but here’s one. Train going through the lower Spiral Tunnel. The part of the train below is passing underneath the part of the same train above. After I finished marveling at the turn-of-the-last century engineering feat, I drove a bit further west and turned onto the Yoho Valley Road, which winds (including a couple of “I hope Kestrel doesn’t rear-end himself” switchbacks) up the Yoho Valley to Takakkaw Falls, the highest single-drop waterfall in Canada, at 850 feet. There’s a trail right up close enough to feel the mist, of course. It really reminded me of Yosemite Valley, only without the crowds. It was also a great place to picnic. Takakkaw Falls, the highest single drop in Canada. And I saw another bear on the way up there. My seventh and last of the trip. I’ve never seen that many bears on one trip before. My seventh and last bear of the trip, along the Yoho Valley Road. The white is snow. And more wildflowers, of course. Forget-me-nots along the Yoho Valley Road. Wild orchid at Takakkaw Falls. The visitor centre at the village of Field, back on the Trans-Canada Highway, was my next stop, with its little exhibit about the Burgess Shale, one of the most famous fossil beds in North America. Unfortunately, the site itself is only accessible by guided tour and a long, steep hike, but at least I got to see some of the fossils. My last side trip of the day was the road to Emerald Lake and the natural bridge along the way. I was more impressed with the natural bridge (and its lovely waterfall) than I was with Emerald Lake. It was still pretty, though. Natural bridge, along the Emerald Lake Road. Emerald (in name only) Lake. The Burgess Shale site is up on that mountain somewhere. And another flower along the Trans-Canada Highway which I’d never seen before. Gorgeous red lilies. Wild lily along the Trans-Canada Highway. Then it was on to the town of Golden, and my hostel for the night, run by a very friendly Scottish woman who fosters cats for the local humane society. First cat fix I’d had since I left home, and very pleasant. She also recommended a restaurant, the Wolf’s Den, which was part historic log cabin and part sports bar, serving an excellent hamburger, salad, and the best onion ring I’ve had since Burgerville perched on top of the burger. The TV was playing the U.S. Open golf tournament, playing this year at Chambers Bay, just down the road from where I live (and part of the reason I timed my trip as I did), which I found rather amusing. And that was my last day in the Canadian Rockies. For this trip, anyway. I’d love to go back someday. I had a day and a half drive to get home, and a few more things to see along the way, though. Along the Bow River Parkway, Banff National Park. Twelve days ago, June 15, 2015. From Radium Hot Springs to Banff, aka, why is there a city in the middle of a national park? Canadians have a much different idea as to what’s appropriate in a national park than we USAians do. I knew that, in theory, before I made this trip. But there’s something just really odd about having what I think of as a gateway community (and a bloody big one) inside the national park as opposed to just outside its border. Let alone what looks like their equivalent of an Interstate highway right through the park. But I get ahead of myself. Twelve days ago today I drove back up into Kootenay National Park, and what should I see right after I emerged from the red rock canyon? A bear! My first one of the trip, but not my last. I don’t have a good picture of him, alas — I’d already passed him before I could get stopped, and there was another vehicle behind me in the pullout so I couldn’t back up, so the two photos of him I do have were taken through the back window of my car (no way was I getting out of my car to get a better look — I pride myself on not being a touron, as the Yellowstone folks sometimes refer to people who seem to be aiming to win the Darwin award). I drove on, chortling about seeing a bear, up the route I’d taken yesterday and beyond, past Marble Canyon and up to the Continental Divide, which is also the border between Kootenay and Banff National Parks. I’m afraid my photo of the sign proclaiming this got sun-glared, but here it is, anyway. The Continental Divide and the boundary between both Kootenay and Banff National Parks and the provinces of British Columbia and Alberta. They mean that about the wild roses, too, especially in Jasper NP. Geographically, I visited Alberta about the way I visit Wyoming when I go to Yellowstone. It’s not far from the Divide to the junction with the Trans-Canada Highway (the aformentioned Interstate-alike), a four-lane behemoth of a road that bisects Banff NP. Fortunately, there’s an alternative, the Bow Valley Parkway, which is a winding two-lane that runs from just north of Banff the town to Lake Louise. I joined it about halfway between, just below the imposing and appropriately-named Castle Mountain (although apparently after WWII, it was renamed Eisenhower Mountain, of all things — that didn’t last long). Castle Mountain, at the junction with the Trans-Canada Highway, hence the light poles. The Bow Valley Parkway is much more traditionally national parkish. Lots of pullouts with informative signs, trailheads, and so forth, and very peaceful, with one exception. I had thought to stop at Johnston Canyon, which was the second of those narrow, deep slot canyons, this one with a trail that goes along the bottom, but the parking area for the trailhead was so full that I couldn’t find a place to park. So I told myself I’d come back the next day, and kept going south to Banff the town. Along the Bow River Parkway. One of the ubiquitous Columbian Ground Squirrels, which actually remind me more of prairie dogs than ground squirrels. Banff the town is beautifully situated, surrounded by some really oddly-shaped mountains (I have to say that I’ve never really seen mountains shaped like the Canadian Rockies anywhere else), and where the Canadian national parks began with a hot spring (more on that tomorrow). It’s also incredibly busy and touristy, but I really didn’t mind. Especially since my hostel, right on the Bow River (pronounced like bow and arrow, not bow or curtsey), was within walking distance of practically everything. The hostel was in a huge old building that used to be a hospital, but it was clean and pleasant and if it felt a bit institutional, that was okay, too. The bridge across the Bow River in the town of Banff. After lunch in a restaurant (in a mall! in a national park! ), I went exploring. Found the Bow River Falls, which were gorgeous. Downstream from the Bow River Falls. This looks so much like Yosemite Valley to me. Visited the Cascade Gardens behind the big stone Banff park admin building, which were another anomaly, albeit an enjoyable one, from my point of view. A view from the Cascade Gardens. Lily of the valley blooming in Cascade Gardens. Everything was blooming about a month later than at home, and they were just putting out bedding plants for the summer. Cascade Gardens and the Banff admin building. Wandered through the public rooms of the Banff Fairmont Chateau Hotel, which was much less iconic looking on the inside than it was on the outside, and drove up to the foot of the gondola, decided that it was not for me (I don’t do manmade heights, and this one made the one at the Tetons that scared me half to death last summer look like a quick lift to the top of the bunny slope), and ended up parked in the shade in their parking lot writing in my journal and enjoying the view. The Banff Fairmont Chateau Hotel. A view from the patio of the Banff Fairmont Chateau Hotel. I’d meant to visit at least two of the museums this afternoon, but it was Sunday and they were closed. So I put them on my agenda for tomorrow. I like Banff the town. It’s just not my idea of what should belong in a national park, is all. A magpie perched on a ledge at the hostel. Twelve days ago, Saturday, June 13, 2015. Into another country. Which was just different enough to remind me that I was in a different country, which was cool. It was a long day, although less than 300 miles or 482 km. The kilometer thing was one of those things that was just enough different to keep me on my toes. It took me a little while to figure out that I could use Kestrel’s speedometer (which has km in red on the inside of the little wheel, and miles in white on the outside) to figure out mileage as well as speed, and I was inordinately pleased with myself when I did. Along the road to the Canadian border. From Colville to the Canadian border just north of Metaline Falls is a stretch of road that felt more and more remote the farther I went. I climbed up out of one river valley and down into another, past several tiny hamlets, and at last I reached a very tidy-looking customs station in the middle of the woods, with a very pleasant white male customs agent. Among other things, he asked me what I did for a living. I told him I was a writer, he asked of what, I told him, he asked more questions, and the upshot was I ended up giving him one of my business cards so he could look me up online and see for himself. He also said, well, maybe you’ll set a book at Banff, and I said, hey, I went to Yellowstone and ended up with a trilogy, so it’s not that farfetched. He laughed and told me to be sure and include the handsome customs agent. I told him I would. I suspect those customs stations out in the middle of nowhere get pretty boring. That one isn’t even open 24 hours a day. Once I crossed the border and turned east on Hwy. 3, I started a serious climb up to Kootenay Pass, almost 6000 feet. Almost to the treeline. My first view of the Rockies, from Kootenay Pass. Then down to another river valley and the farming town of Creston, where I found an ATM for cash and I bought my first gas in litres, which was interesting. I’d made a calculation before I left home, taking into account that a litre is a bit more than a quart and the favorable exchange rate, and had come up with multiplying the litre price by 3.2 so that I’d have a rough idea what I was actually paying. Gas is a bit more expensive in Canada than in the U.S., but it wasn’t as bad as I’d been thinking it would be. From Creston, and lunch, where I also discovered that I couldn’t get unsweet iced tea (something that proved fairly consistent wherever I went — I drank a lot of hot tea instead and added my own lemon), I turned north and east towards the city of Cranbrook. I’d read about a living history museum near Cranbrook called Fort Steele, which made an excellent afternoon stop. It’s sort of a cross between Greenfield Village at the Henry Ford Museum in Detroit, Michigan, and Fort Nisqually just down the road from where I live. It’s a whole village of 19th century buildings that have been brought here from all over the region, with living history demonstrations and the whole nine yards. Not a whole lot was going on at the time I was there (part of the issue was that I’d crossed into the Mountain Time Zone without realizing it, and it was half an hour from closing when I showed up), but it was still well worthwhile, learning about the Hudsons Bay Company and the Mounties and so forth. The Mounties headquarters at Fort Steele. The sign says, “Painless Dentistry.” Somehow, I don’t think so. But I had another couple hours’ drive to get to Radium Hot Springs, a town on the outskirts of Kootenay National Park where I planned to spend the next couple of nights, and I’d just realized the time change (there’d been no sign, anywhere, to tell me), so it’s a good thing it was a straight shot north, up the valley past Columbia Lake, which is the headwaters of the Columbia River (which flows north at this point, which is just wrong). A wall of mountains on my left, another on my right, in between a string of lakes and me on the road. Just beautiful. The headwaters of the Columbia River. The hostel was on a hill above town just outside the park entrance, and had a lovely garden and a very friendly dog to boot. A good place to light while I explored my first Canadian national park (at least since I was a kid). The view from the hostel deck, Radium Hot Springs, BC. From British Columbia to about halfway through Oregon. We drove south through Hope, BC, then crossed the border for the sixth and last time back into the U.S., into Washington state, where we picked up I-5 and simply booked. Through Bellingham, Everett, Seattle, Tacoma, Portland, and Salem. 463 miles, according to Google Maps. We stopped at a KOA campground, our first of the trip, as I noted in my diary. When we visited parts of the continent less remote than Alaska and the Yukon, KOA campgrounds were something we looked for about every third night. They’re sort of the Motel 6s of campgrounds, or they were back then. Dependable but not fancy, with the same hookups and facilities from campground to campground. In the days before we had the trailer with its own bathroom, we always counted on KOAs for showers and that sort of thing, too. Little did I know when we spent the night near Eugene, that when I was in my twenties I’d end up living there for several years. Not in the campground, of course, but in Eugene. It sits at the head of the Willamette Valley, nestled in the evergreens with mountains ringing it in every direction but north. At the time I lived there, just after the height of the spotted owl controversy in the mid-80s, it was sort of the hippie equivalent of the elephant’s graveyard. Also sort of like the Island of Lost Toys in Rudolph the Red-Nosed Reindeer. If you didn’t fit in anywhere else, you’d be fine in Eugene. I really loved Eugene. I’d probably still be there if it weren’t for a set of circumstances too convoluted to be described here, although it’s not the same place it was back then. It was hot when we got there. Fortunately, the campground had a swimming pool, which I enjoyed that evening. Also fortunately, the electric hookup allowed us to run the trailer’s air conditioning. We went to bed early to get an early start the next day and ran it all night long. Now it was just a race against time to get back home before my father’s vacation days ended, so we spent the day making miles. We drove a bit over 400 miles on this day, through Prince George, Quesnel, Williams Lake, and Cache Creek, to just a few miles north of the U.S. border. We hit hot weather for the first time since we’d left California six weeks earlier, and stopped at a campground next to a creek where I went ‘swimming’ (I doubt it was deep enough to do more than wade), also for the first time on the trip, to cool off. And we went to bed early, with all the windows open to catch a breeze, so we could get an early start the next morning. We left out early that morning — 6 am. My father was always something of an early bird, but this was early even by his standards. The first sight we passed by was Muncho Lake, the name of which amused me. My diary says it was a very pretty lake, however, and the pictures I’ve been able to find on the web agree. We then drove over what was then known as the coal stretch of the Alaska Highway, and added a black coating to the dirt already on the car and trailer from several hundred miles of gravel road. I remember that for most of our trip, it was impossible to tell the color of the car without checking the roof, and that the trailer looked bi-toned — white from about five feet above the ground and brown below. We crossed into Yukon Territory and stopped at Watson Lake, renewing acquaintance with the people we’d been sharing campgrounds with for the last several nights, and perusing the famous Watson Lake signposts. Watson Lake itself was very pretty, but the signposts, an enormous collection from all over the world, were the main attraction, at least for fourteen-year-old me. We also bought a $5 Yukon camping permit in Watson Lake, and went fishing, but didn’t catch anything. We spent our first night in the Yukon in what was then the Rancheria Territorial Campground, and is now a private campground The scenery is still just as lovely, though, according to their website. And that was the day we crossed into the Yukon. Directions on the Alaska Highway were, in 1973 (I don’t know if they still are) given with reference to the milepost markers beginning with Mile 0 in Dawson Creek, and Mile 1523 in Fairbanks, Alaska (the official end of the highway is actually in Delta Junction, a few miles shy of Fairbanks, but a large sign in the middle of Fairbanks says (or said back then) that it’s the end). At any rate, that’s what’s with the “milepost 403” notation in the location of today’s entry. Sometimes I put that in my diary entries, sometimes I didn’t. I don’t know why 115 Creek is named 115 Creek, but apparently it was a provincial park that must not exist anymore, since googling it is not bringing up an official website. We also went through a small community called Wonowon that day, which was, appropriately enough, situated at milepost 101. The highlight of the day’s drive was a moose sighting. A cow and her calf, apparently. We also stopped to add a bug screen to the front of the car. I do have vivid memories of the mosquitoes in that part of the world. It seemed that the farther north we went, the more there were and the bigger they got. But I suspect that at least part of the reason for the bug screen was also for its gravel-fending properties, to keep the windshield from getting hit. We had long since lost the pavement by milepost 403, since only the first 70-something miles of the road were paved at that point. We were well into the 1200 miles of gravel. The next pavement would be at the Alaska border. We also bought postcards at a gas station/general store and mailed them from the in-store post office, which makes me wonder how many cell phone towers and/or wifi hotspots there are along the Alaska Highway now. We also seesawed back and forth with a German gentleman in a VW Vanagon whom we’d met the night before, and one of the families with kids. It’s amazing how little I wrote about the scenery. What I remember of it along the early parts of the road was an unending forest of scrubby evergreens with a few lakes along the way. But that would change soon. And, finally, on to the Alaska Highway (or, as I spelled it, Hiway — I think that was a deliberate misspelling, probably from seeing it on signs along the way). The first interesting thing we saw, however, happened not long after we left Whisker’s Point early in the morning, and that was a bobcat dashing across the road, which was very exciting. We stopped for lunch in Dawson Creek, and to take pictures of the “the Alaska Hiway begins here” sign. As I recall, there was also one of those many-pointed signposts with each arrow labeled something like “New York City, 2783 miles” or “Beijing, China, 9705 miles.” By the way, I just used Google maps to get that last number, and the directions include the words “Jet Ski across the Pacific Ocean.” Also, “Kayak across the Pacific Ocean.” The first to Hawaii and the second on to North America. I guess Google wants people to use a variety of modes of transportation. But I digress. 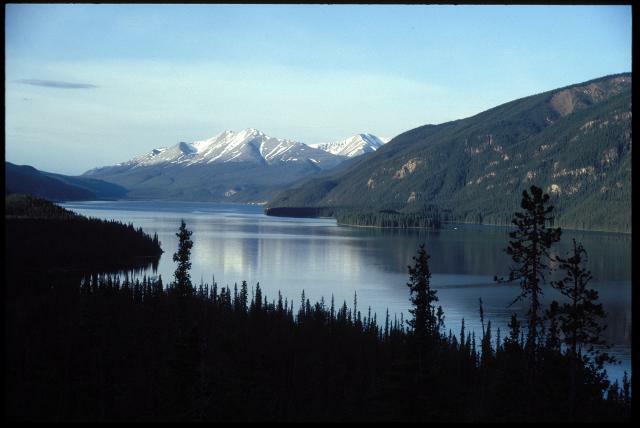 Even in 1973, the first few miles of the Alaska Highway were paved. We stopped in the town of Fort St. John for groceries. We stopped for groceries (which I apparently recorded faithfully) frequently, I suspect because the refrigerator in the trailer was pretty tiny. At least we didn’t do what we did on another trip a couple of years later and forget to latch the fridge shut. This destroyed a jar of pickles and a jar of strawberry jam when the door swung open around a curve and they fell out. That combination is one of the nastiest to clean up on record. Just the smell was bad, and the stickiness was even worse. We camped just north of Fort St. John at a campground called Hillcrest, and discovered another unusual aspect of traveling the Alaska Highway back then. We met up for the first time with several other groups of campers who we would see night after night at the same campgrounds as we all traveled about the same distance every day. A couple of the families had kids of varying ages, which I happily noted in my diary. It gave me people to hang out with in the evenings.